It’s been really cold in South Texas lately and that means that it’s a soup day, though, in my world, anytime is a good time for soup. Gazpacho and cucumber soup will cool you off in the summer. I’ll take Manhattan clam chowder whenever. During the fall, choose a butternut squash and even a mighty fine pozole. Soup is a great starter to tease the palate for what’s to come and, if it’s hearty enough, it can be an even better meal. I’ve been known to empty the vegetable drawer and turn it all into soup–puree it together and no one will be the wiser. Even better is that your vegetable drawer will thank you–mine did. When I recently had an abundance of beautiful organic broccoli from 3-G Farm (worms included) that I brought home from the Quarry Farmers & Ranchers Market, I had to think about this for a few. It was way too much broccoli to serve as a side, but soup would work. 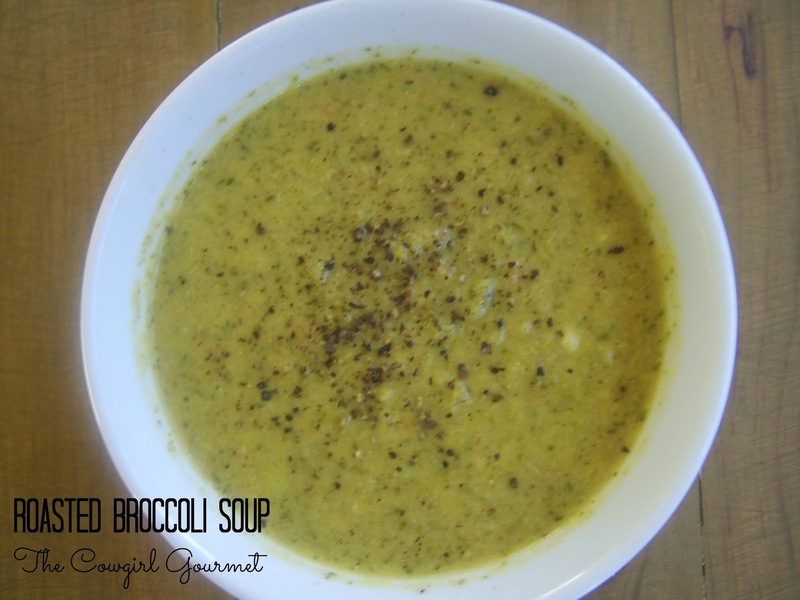 Boring broccoli soup was not going to cut it, though a roasted broccoli soup just might. I have never met a roasted veggie I didn’t fall for. Caramelizing the veggies in a hot oven really imparts a depth of flavor that cannot be obtained by sauteing, steaming or blanching. I love roasting broccoli (and cauliflower), so why not roast the broccoli first and then make the soup? For a bit of added creaminess, I tossed in a little cheese from Dos Lunas. David asked for seconds and a friend who stopped by to visit was more than grateful for the delicious nourishment that warmed her heart and her panza. As they say in Mexico, panza llena, corazon contenta. Your heart is content when your belly is full! As the soup Nazi, I had never roasted the veggies before turning them into soup, but this really brought the flavor to another level. Using a combination of a few cups of low sodium vegetable or chicken broth and water minimizes the sodium and adding a half cup of cheese gives it just enough creaminess. Obviously, if you are vegan, eliminate the cheese or choose a vegan variety. A bit of red pepper flakes adds just enough heat. Preheat the oven to 400 degrees. Tightly wrap the garlic cloves in aluminium foil and roast for 50 minutes or until softened. On a baking sheet, place a piece of parchment paper and toss the broccoli with the olive oil and melted butter and sprinkle with salt and pepper. Roast for 20 minutes or until tender. While the broccoli and garlic are cooking, heat a soup pot over medium high heat and add the remaining 2 tablespoons of olive oil. Toss in the chopped onion, celery and carrots and sprinkle with salt and pepper and stir well to combine. Stir frequently and cook for 5 minutes or until softened. Add the red pepper flakes and stir again, cooking a few more minutes. Pour in 3 cups of water and let cook 10-15 minutes so the water becomes flavored. Pour the broccoli, garlic and broth puree into the pot with the onions, carrot and celery and cook over medium heat for 10 minutes. Using an immersion blender, puree the soup well so there are no chunks--though if a few remain, it's fine. If using, add the cheese, stirring well to allow the cheese to melt. Increase the heat to medium-high and bring to a simmer. Taste the soup and adjust seasoning, if needed. Serve in bowls, season with a finishing salt, such as Maldon, and pepper and, if desired, a squeeze of lemon juice. That looks delicious! We make a broccoli cheddar soup from Cook's Illustrated that is terrific (and much more vegetable heavy than your traditional broc/cheddar…the soup is actually green 🙂 and I'll bet roasting the broccoli would make it even better. Roasted broccoli is my favorite way to eat broccoli. I'm bookmarking this soup recipe! Gita, you can definitely freeze this and enjoy it whenever! Yea! Let me know how you like it! Jessica, roasting the broccoli for the soup is THE trick! I am in love with this soup! Stacy–looks like Caroline is going to be happy! Let me know how it goes!